"Every spring is the only spring--a perpetual astonishment. " Spice up your Father's Day festivities with an activity or two. Plant a fruit tree together. We suggest giving Dad a cool one in his easy chair and letting him see you sweat for a change, while you install a wonderful fruit tree. We recommend fertilizing monthly and spraying as needed with organic pesticides. Dad will be able to enjoy your tree and its fruit year after year. Be sure to interview your father and/or grandfather. Ask questions about his birth, childhood, and what he did when he was a teenager. Find out favorite subjects in school, how he met your mother or grandmother. Inquire about his favorite job. End the interview by expressing your love for him. Get together with a few other families and play the Father/Child Game. Divide into four father/child teams. Ask the fathers to leave the room while the children sit in chairs. Ask the same four or five questions to each child about their fathers. Bring in the fathers and ask them the same questions. Will the father and child have the same answers? Switch places and see how well the fathers know the children. Award a red rose to the winning father/child team. Have a Father's Day BBQ or picnic in your garden. Make a crown for dad and let him know he's "King" for the day. This can be a family activity--or extend an invitation to a few other families also. Make sure all the dads are given "The Royal Treatment." While mandatory water restrictions may loom in the near future, the best way to avoid them or be prepared to make do is to think about how you can lower your water usage at home. Luckily, you won't have to resort to keeping your showers to once a week yet, because most water usage, and potential for reduction, is outside your home. Here are some ideas to lower your water consumption without surrendering your yard to the desert. Doing a monthly adjustment on your water timer can save hundreds or even thousands of gallons of water a month. You don't have to stop watering your lawn, but watering it for longer periods less often will allow the water to soak to the roots and prevent evaporation. Adding an automatic or manual rain delay will also keep you from watering during or after good rain, when your lawn doesn't need it. Decrease the footprint of your lawn. Eliminating underutilized sections of your lawn will save you time, money, and tons of water. You won't have to water, mow, dethatch, or seed lawn that no longer exists. Take an honest look at your yard, and think of what else you could grow around the edges. Bushes, trees, succulents, and vegetable gardens work great around the edges of your yard, providing, shade, color, and privacy, all while helping you save water. Dethatching removes old, dead growth, making it easier for the water to penetrate the soil, and leaves room for new growth to thrive. Letting your grass grow longer will help keep moisture in, and the sun away from the dirt, lessening evaporation. It's very easy for you to have an underground leak in your irrigation system that leaks water incessantly, costing you money and wasting loads of water. Check around your sprinkler and drip lines and keep an eye out for areas that are too wet, have much faster-growing vegetation, or sunken impressions in the ground. These are all signs that you have a leak. If you're not comfortable doing irrigation work, it's not a bad idea to talk to a professional so you know it's fixed correctly. Trim bushes back from sprinklers. If it's been awhile since you trimmed your bushes, you should check to ensure they are not blocking your sprinklers. If you want to let them grow bigger, you should consider either raising or relocating your sprinkler heads so they will continue to get to the lawn. If not, trimming the bushes back a bit will help make sure the water you're using gets where it needs to. Add a layer of mulch to your shrubs and trees. Keeping a layer of mulch around your larger plants helps keep moisture in, keeps the weeds to a minimum, and can add a nice decorative touch to your beds. Use plants that need less water. There are a large variety of plants that are either native or adapted to our climate, and will require less water than more tropical varieties. Ask one of our associates for some ideas that will work for your circumstance. Saving water is easy, and it has the potential to save you some cash and make your yard much more sustainable. If everybody reduced their usage a bit, the savings could be huge. 1. Continue to plant melons. 2. Plant tropical and subtropical plants. 4. Plant perennial morning glories. 6. Continue to purchase epiphyllums. 7. Plant seeds of heat-loving annuals. 8. Use bedding plants for quick color. 9. Continue to plant summer vegetables. 12. Purchase, plant and transplant succulents--including cacti and euphorbias. 13. Purchase alstroemerias throughout summer while they are in bloom. 14. Plant papayas and bananas. 15. Plant and transplant palms. 16. Continue to pick and deadhead roses. 17. Pinch back chrysanthemums to make them bushy. 18. Divide and repot cymbidiums that have outgrown their containers. 19. Remove berries (seed pods) from fuchsias after flowers fall. 21. Thin out deciduous fruit trees after June drop. 22. Give marguerites a "butch" haircut. 23. Cut back gamolepis and euryops. 24. Deadhead and pick summer flowers to keep them going. 25. Mow cool-season lawns longer. 26. Mow warm-season grasses shorter. 27. Clip runners off strawberries. 28. Prune climbing roses that bloom once a year in spring, but wait until flowers fade. 29. Divide English primroses after bloom or wait until September. 30. Continue to prune and train espaliers. 31. Continue to remove spent bloom stems from daylilies and to propagate the types that make proliferates. 32. Deadhead alstroemerias often by pulling off the stalks with a sharp tug. 33. Look for yellow leaves and green veins indicating chlorosis in citrus, gardenias, azaleas, and others; treat it with chelated iron. 34. Feed citrus and avocado trees. 35. Feed bamboo with a slow-release fertilizer. 37. Fertilize cymbidiums with high nitrogen for growth. 38. Give camellias their second feeding for the year. 39. Feed container-grown annuals and perennials with a complete fertilizer. 40. Side-dress vegetable rows if you didn't do it last month. 41. Give strawberries a shot of 0-10-10 to prolong the harvest. 42. If peppers look yellow despite adequate nitrogen, spray them with Epsom salts. Homegrown peppers are fun to grow, healthful for you, and packed with flavor. They taste great whether eaten fresh, roasted or sautÃ©ed. Many people start with one variety and quickly discover it's even more fun to experiment and grow multiple varieties that produce a medley of flavors. 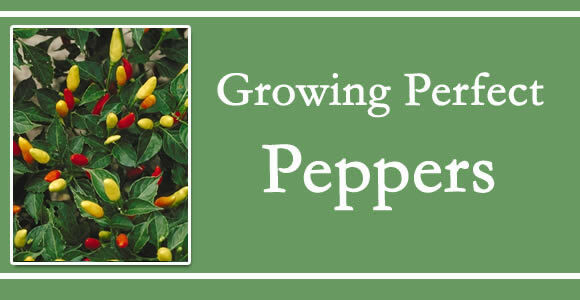 The biggest mistake gardeners make is planting their pepper plants too early. You can start them from seed indoors early in spring, but it's best not to transplant starter plants until the soil has warmed and night temperatures stay above 55-60 degrees. Peppers do best in well-amended soil, so make sure to amend your vegetable bed before planting. They prefer a long, moderate growing season. If it is too cool, peppers might not quite ripen fully, and the fruit won't set well when daytime temperatures stay above 90 degrees (shading them some can help during a string of hot days). It's very important to keep the soil consistently moist; otherwise the peppers can crack or get sun scald. Make sure to apply a rich organic plant food high in calcium at the time of planting and every two months during the growing season. This helps prevent blossom-end rot. Once your peppers change to their mature color, it's time for harvesting. Then sit back and enjoy the fruits of your labor. Rose lovers are a breed onto themselves, because one cannot simply stick a rose plant into the ground, walk away, and expect perfect blooms year after year. They take work, but if you are a true rosarian, the results are worth the effort. The roseâ€™s susceptibility to black spot, which is a fungal disease caused by Diplocarpon rosae, is worse than mildew or rust because black spot frequently kills plants. Itâ€™s particularly deadly for non-resistant hybrid teas. Miniature roses are also highly susceptible. Recognizing black spot early on is essential to its elimination. Look for small black spots with feathery edges, on the upper leaf surfaces; lower branches will be affected first. As the disease progresses, the spots will enlarge, become ringed with yellow, and-- if the black spot is not stopped--the leaves will eventually turn entirely yellow and drop. Defoliation can cause the plant to die. But have heart: a combination of prevention and fast action once the black spot is noted can save your plants. Do your research for your area, and plant resistant rose varieties. Placement is of upmost importance; plant far enough apart to allow for lots of circulation. Black spot fungus requires water to reproduce and grow. Plant your roses in full sun. Water in the morning to give your roses plenty of time to dry out. When you prune, immediately remove all diseased leaves and canes to the trash to prevent its spread to other plants. After pruning, use a dormant season horticultural oil spray. A combination of 4 teaspoons of baking soda per gallon of water with a 1% solution of narrow-range horticultural oil is one way to manage black spot, along with powdery mildew. Avoid getting it on open blossoms. Neem oil may also prove effective. Don't rule out preventive sprays of fungicides such as triforine or chlorothalonil. Checking for black spot gives you the best excuse to closely examine your roses. While doing so, we suggest you stop and smell them, too. How often should I cut my lawn? The easy answer would be once per week in the growing season. A good rule-of-thumb is to remove no more than one-third of the grass height at any one mowing. For example, if you are maintaining your lawn at 2 inches, mow the lawn when it is about 3 inches high. Cutting off more than one-third at one time can stop the roots from growing and will require more frequent watering during the heat of summer to keep the grass alive and healthy. Following the one-third rule will produce smaller clippings that will disappear quickly by filtering down to the soil surface. If the grass becomes too tall between mowings, raise the mowing height and then gradually reduce it until the recommended height is reached. For the best appearance, mow and maintain your lawn at the best height for growth as determined by the type of grass you have. You can usually mow a grass that spreads horizontally shorter than an upright-growing bunch-type grass. Grasses with narrow blades can generally be mowed closer than grasses with wide blades. If your lawn is under stress--such as heat, drought or shade--mow at a higher level of cut. Proper mowing is important in maintaining a healthy lawn because it encourages a dense stand of grass plants. A dense turf keeps out weeds through competition for sunlight and nutrients. A weak, thin turf allows weed seeds to germinate and grow. Mowing practices can also affect the occurrence of disease. Many times an increase in disease can occur when turf is cut too low or is mowed when the foliage is wet. One final tip: Don't mow in the same direction each time. Alternate your mowing direction and you'll have more upright grass growth and a smoother-looking lawn. Put everything except the sesame seeds in a large bowl. Let stand 10 minutes so that flavors can blend. Divide the fruit mixture among wineglasses and sprinkle with sesame seeds.